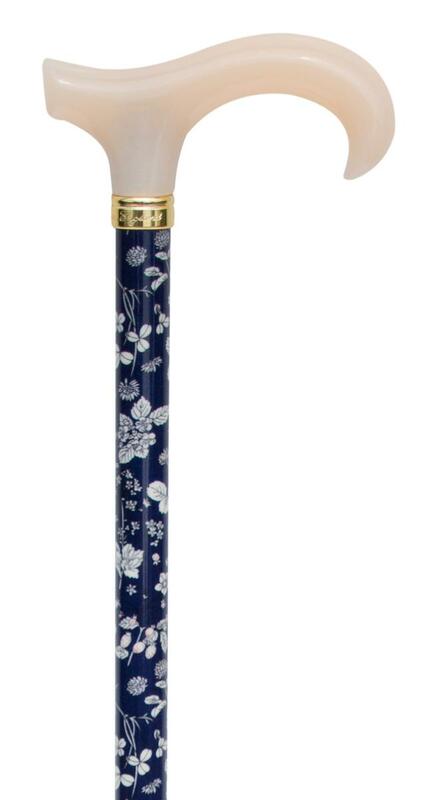 This is a very stylish, high quality walking stick. The pale peachy-cream acrylic handle feels wonderfully smooth in the hand and provides excellent support. The shaft is made from lightweight aluminium, which is strong and very light. It is wrapped in a sealed, patterned fabric, which gives the shaft a lovely, slightly textured appearance. 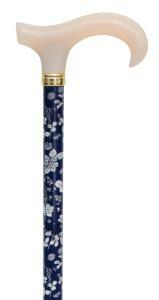 The pattern is of white strawberries, currants and foliage with pale pink touches on a dark navy blue background. The stick is height-adjustable between 67-90cm (approximately 26"-35.5"), and is fitted with a smart brass collar and a non-slip rubber ferrule.